The Chinese Parrot (1926) is the second novel in the Charlie Chan series of mystery novels by Earl Derr Biggers. 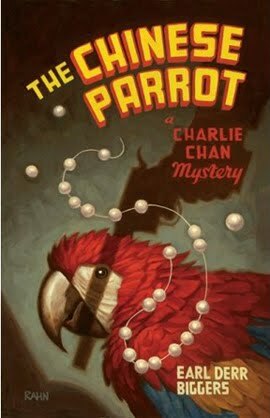 It is the first in which Chan travels from Hawaii to mainland California, and involves a crime whose exposure is hastened by the death of a parrot. 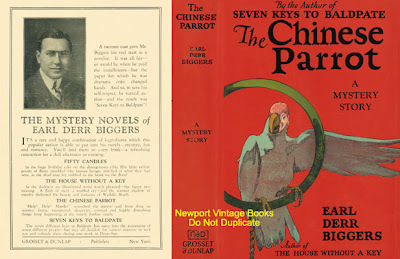 The Chinese Parrot (1927) is also a silent film in the Charlie Chan series directed by Paul Leni. The film is an adaptation of the 1926 Earl Derr Biggers novel of the same name. The film stars Japanese actor Sojin as Charlie Chan. It is considered to be a lost film. Plot summary: The story concerns a valuable string of pearls which is purchased by a wealthy and eccentric financier. The handsome young son of the jeweller is assigned to shepherd the transfer of the pearls to the financier's vacation home in a desert area of California. Because of his long association with the owner of the pearls -- before joining the police force, he was her houseboy -- Charlie Chan travels from Hawaii to California with the pearls. 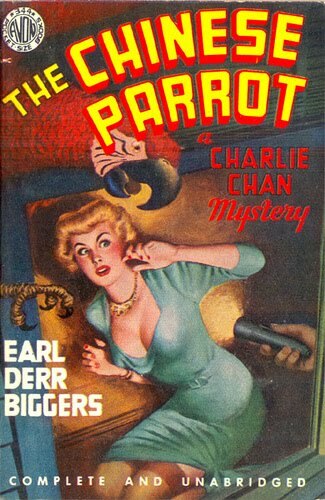 After two mysterious deaths, first of a Chinese-speaking parrot and then of the household's Chinese man-of-all-work, Charlie Chan masquerades as a pidgin-speaking cook named Ah Kim and works underground to solve a number of crimes. Along the way, the jeweller's son meets a beautiful young woman who works as a location scout and decides to stay in the California desert.